The FloorFix™ connector is designed for positioning raised pattern floor plates without the need for welding or drilling of the supporting steelwork. With simple hand tools, it can be installed by one person working from above and eliminates the need for access to the underside of the floor plate. The FloorFix™ is TÜV certified for vibration. The FloorFix™ connector can be secured quickly and likewise removed or repositioned with ease. 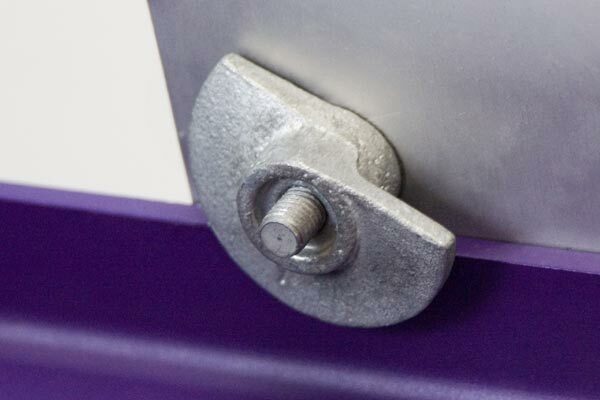 The FloorFix™ connector is supplied with a galvanized finish. 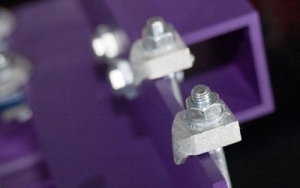 The FloorFix™ HT connector is designed primarily to secure raised pattern floorplates to supporting steelwork from the top side only, with no need for drilling, tapping, bolting or welding. Working on a cam mechanism, it can be installed by one person working from above using a basic hexagon key drive. FloorFix™ HT connector allows for a high degree of tolerance when installing steel flooring, up to +/- 0.25” of its intended position. The FloorFix™ HT connector is supplied with a galvanized finish. FloorFix™ and FloorFix™ HT are available from our specialist subsidiary company, LNA Solutions based in Ann Arbor, Michigan. For more information and technical specifications please visit the LNA Solutions website.